Fit For A Queen of Atlanta LLC was established in 2015 by Lady Danzy. The Lady of the House has traveled throughout the United States and across international borders to personally handpick each gown, creating the exclusive Fit for a Queen Collection. Our collection consist of the most sought after gowns for our royal beauties. 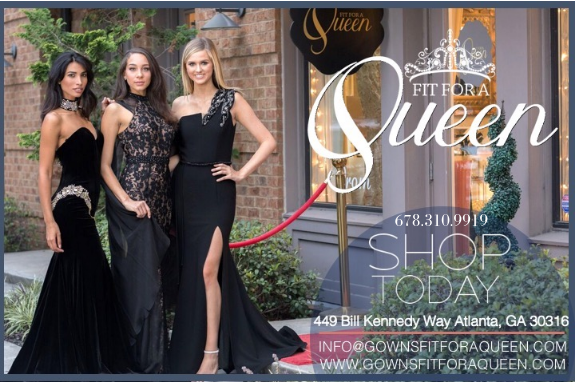 Fit for A Queen of Atlanta offers custom-made and designer gowns for prom, pageant, and formal occasions ranging from sizes 00-32W. We are the only pageant, prom, and formal gown store in Atlanta offering custom made gowns! If interested in a custom designed gown, contact us to schedule an appointment with one of Atlanta’s top designers. To complement our gorgeous gowns Fit For A Queen carries a wide selection of designer and custom made jewelry, clutches, special occasion shoes and undergarments (i.e. body shapers, gel bras, fashion tape, etc.). Check out our Pageant Corner, highlighting Atlanta’s top professionals in the pageant industry. Get additional discounts, tips, and more from our Pageant Partners! Contact us today to book an appointment for your prom, pageant, or special day!